The OECD Initiative on Water Governance is an international multi-stakeholder network of about 100 representatives of public, private and non-profit which meets twice a year in a Public Policy Forum to to share experiences on ongoing reforms, projects and best practices to support better governance in the water sector. 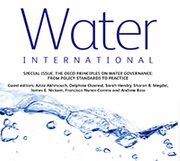 The governance of water is subject of a special working group (WG 3) co-hosted by INBO and UNESCO. This call seeks to support the implementation of the OECD Principles on Water Governance through the identification of evolving practices at local, basin, national and international levels which can inspire governments and stakeholders move from vision to action. The objective is to gather/compile evidence and concrete examples of how a given city, region, country, basin organisation or other stakeholder has addressed governance gaps in water-related policy design and implementation, whether they relate to success stories or, conversely, to failed attempts from which helpful lessons can be learned for the future. 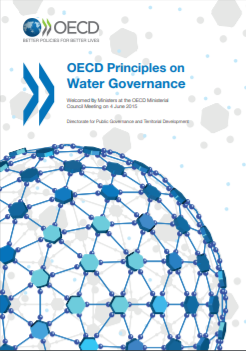 4/06/2015 - Ministers from OECD's 34 member countries today welcomed the newOECD Principles on Water Governance, which set standards for more effective, efficient and inclusive design and implementation of water policies, and encouraged governments to put them into action.